More than 900 km in two days, just one night of proper sleep and one shower. Summing up: we are tired, smelly, happy and lost in Morocco! If you are following our journey you already know that we finished a Moroccan Tour around the countryside, slept in the Sahara Desert, and now we were lost, literally lost in Morocco! Our van was going back to Marrakech and we needed to go to Fes (opposite way). 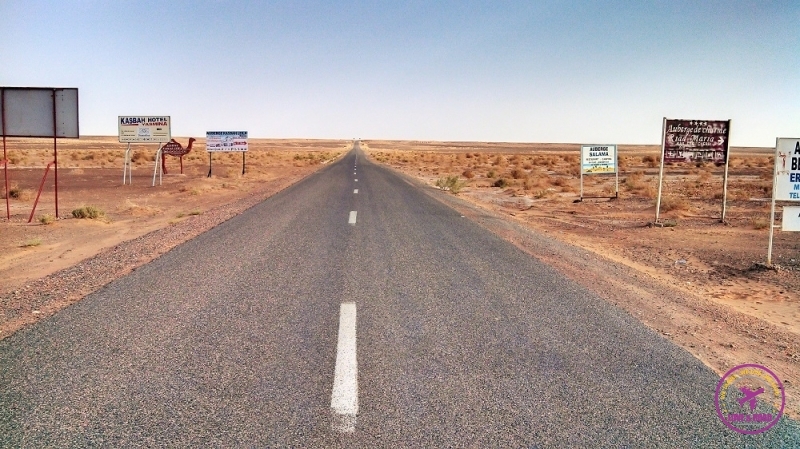 After a Google research, we discovered that from Rissani(a town near Merzouga) we could take a bus straight do Fes. Faster & cheaper than going back to Marrakech. Turned out to be a much more difficult and adventurous way. One thing that I have learnt is: Don´t trust on busses` timetables and all the information displayed online! 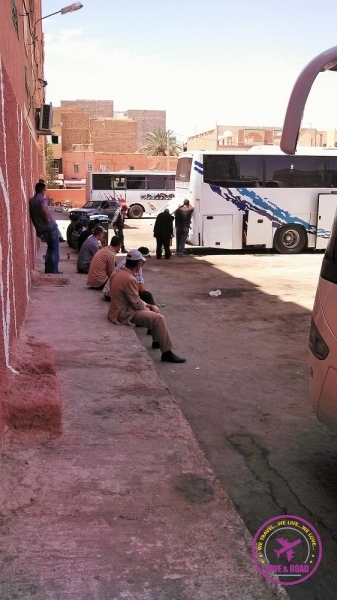 It was supposed to have a bus from Rissani to Fes every day at 12:15pm. The truth is: There is a bus two or three times a week at midnight. Uhuuullll!! We were in a town in the middle of nowhere with no bus to our destination. When you can’t trust the internet you have to start trusting in people. At this point, our “lost in Morocco adventure” started. At the bus station, we found a Korean girl, lost as well. 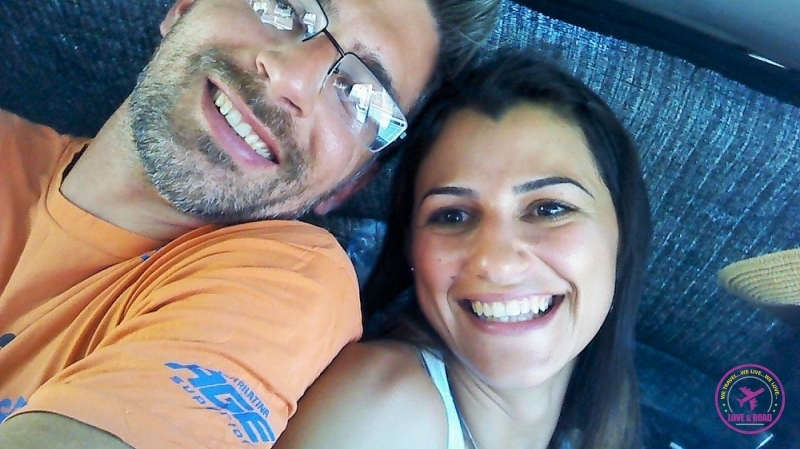 Together we started our odyssey to Fes. An old man from the bus station explained to us about the timetables and oriented us to get a grand taxi Errachidia to, a bigger city, and take a bus from there to Fes. Believe me, things can always get worst and funnier. The Grand Taxi is not a van, neither a small bus. The Grand Taxi is a very old Mercedes where they put four people on the back seat, two in the front, plus the driver. Ohh yeahh baby, super comfy, safe and fresh. One hour and a half roasting inside the car. At least we have a horrible selfie to laugh about. The taxi ride finished and we were lost in Morocco again. The guy who was squeezed with us on the back seat noticed that we had no clue how to reach the Errachidia bus station, so he walked us till there. Thanks!! One more great person in our way!!! We were the only tourists at the bus station. With no french Rob manage to buy the ticket for a reasonable price and in less than 10 minutes we were on the bus. Everything so quick, a big rush to fit everybody inside. However, when we were supposed to depart the bus engine didn’t start. Failed! No problem, the driver can fix it in 20 – 30 min! The trip started, we were still lost in Morocco, the only difference is that we were inside the bus. A four-hour trip, every time the bus stopped we couldn’t understand where we were, if we could go to the toilet or buy some food. The communication between driver and passengers were all in Arabic. 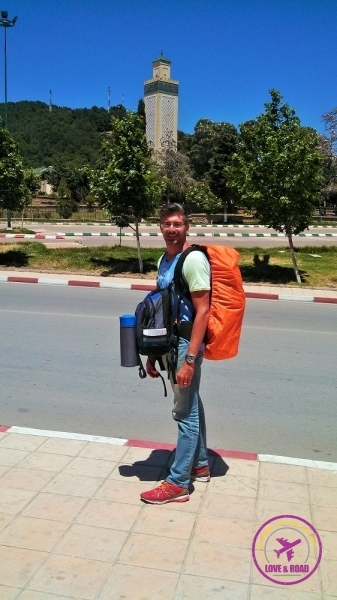 We crossed the Middle Atlas Mountains, a stunning oak forest, rivers with light blue water and simple villages. One more prove that Morocco is a country of contrasts. The bus was really old, with people seated on the floor, animals, bags of food and Arabic pop music playing on the travellers mobiles. We had to get lost to discover the real Morocco. Finally we arrived in Azrou and someone outside the bus just yelled: Bus to Fes!! That was the call to jump off the bus and find our next ride. The Korean girl ran to get the following bus and head to Fes, we decided to stay in Azrou. We exchange goodbyes and our adventure partner follow her way. We were too tired and starving (we didn’t eat a proper food since the dinner on the night before), impossible to travel for two more hours. The pit stop turned out to be a good choice, from lost in Morocco in the morning we became lost in Azrou on the evening! Azrou is a tiny beautiful city in the mountains, no tourists and helpful people. In less than 30 minutes we were in a hotel room, freshened up and ready for dinner. We pressed pause on our Odyssey to Fes. The trip wasn’t as easy as we imagined, but at least we didn’t spend more money than we expected, also we lived an experience that we will never forget. From Lost in Morocco to in Love with Morocco. We spent a bit over a month in Morocco in 2012. It’s still one of my favorite places. Thanks for the memories. I can relate to so much of your story. Although we didn’t get lost, from Merzouga to Rissani then we went back to Marrakesh and took the train up to Fes. I’m sure it was more expensive than the bus. Thanks for stopping by! We are so glad that you liked the post. Morocco is such an amazing place, even getting lost was a great experience. We thought about going back from the desert to Marrakech and later take the train to Fes, but money wise it would be expensive. We got the cheapest and more adventurous way! Why don`t visit Liberia and Guinea ?They are beautiful African countries. Please,tell me more about yours trips.Thank you ! Definitely we need to explore more Africa, it´s a beautiful country. It´s in our plans for 2016! We stayed in a simple hotel close to the bus station, I don’t remember the name. We arrived there so tired and stopped by the first place we found. Hope you are having fun in Marocco!